Welcome back, Idaho Steelheads fans. This is a two week update as well as a playoff preview as we now know officially which team the Steelheads will be playing in the first round of the Kelly Cup Playoffs. Let’s go back to the three game series against the Ontario Reign. The Steelheads ended up losing two out of three games. Idaho lost 5-3 on Wednesday, March 20th, they came back and won 3-0 on Friday, March 22nd, but on team awards night the Steelheads fell flat and lost by a score of 5-0. Due to the split series between the two teams, the Alaska Aces clinched the Western Conference, the Mountain Division and their 3rd straight Brabham Cup as the team with the best record in the ECHL. The only drama left in the Western Conference coming into the final week of the regular season were which teams would finish in the five, six and seven positions in the conference. The Las Vegas Wranglers only needed three points coming into the weekend to clinch the fifth seed, and they were able to get two of those points with an easy win over the Ontario Reign. That win coupled with a loss by the Colorado Eagles, allowed Las Vegas to clinch the fifth spot. The Colorado Eagles had a five point lead over the Utah Grizzlies for the sixth seed, but with the two teams playing each other 3 times to end the season, their playoff fates were in their hands. The Grizzlies won on Wednesday to pull within three points and maybe make the Eagles feel a little bit of pressure, but if there was any, it was taken care of with an Eagles 7-2 victory last Friday, that clinched the sixth seed for the Eagles and allowed the Grizzlies to settle into the seventh spot. The Steelheads had three games this past week, two against the San Francisco Bulls and one against the Stockton Thunder. The Steelheads would win both games against the Bulls. In Wednesday night’s game the Bulls and Steelheads would go into overtime tied at 0-0. However, just 53 seconds into the overtime period, Tyler Gron would get his 20th goal in only his 32nd game with the Steelheads this season for the game winner. Friday night, the Steelheads would have all lines clicking as they defeated the Bulls once again. This time the final was 5-0. Adrian Foster making his return to the lineup netted two goals as Ben Ondrus, Rob Linsmayer (ATO), and James Isaacs were credited with the other 3 on the night. ATO signee Chris Rawlings earned his first professional shutout in his first professional start, by stopping all 23 shots he faced. Rawlings was the first goaltender not named Robinson or Beskorowany to start a game this year. He was also the 3rd Steelheads goaltender to get a shutout and the 3rd different goaltender in the last 5 games as well (Robinson 3/16 & Beskorowany 3/27). The Steelheads went into Stockton to take on the Thunder with absolutely nothing to play for and the team played like it. In the first period Stockton put three goals up against Tyler Beskorowany. In the second, Besko gave way to Chris Rawlings who played well only allowing one goal over the last 2 periods of play. The Steelheads would fall however by a final of 4-2. Bear in mind the Steelheads had kept, Ben Ondrus, David de Kastrozza and Adrian Foster along with others out of the line-up for maintenance as the team prepares for the upcoming playoffs. The Steelheads were 7-1 against the Eagles this year. However they are 1-1 against them in the only two match-ups since the end of the NHL Lockout. Austin Smith led the charge against the Eagles scoring 4G to go along with 5A over the five games he played against the Eagles. Josh Robinson went 5-0 against the Eagles with a 2.00gaa and a .943sv percentage. 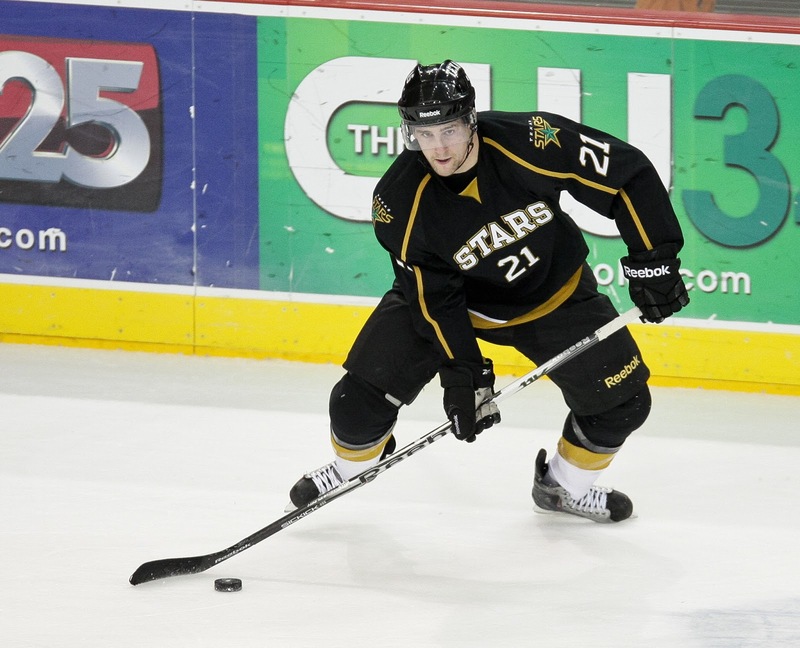 Colorado Eagles forward (and former Texas Star) Michael Forney was second in the league in scoring with 35g 44a for 79pts. Steelheads head coach Brad Ralph can’t really make a bad decision in terms of starting goaltender for game one of the series, but I would look for Josh Robinson to get the start. Despite the 5-0 record which is compelling enough, Robinson was playing very well down the stretch and earned the start. My only concern is that it would have been nice if Robinson had gotten some playing time over the last week while up with the Texas Stars. Worst scenario here, Robinson gets a one game grace period before there is any thought that he is rusty. The Steelheads have only filled 20 of their allotted 23 man roster for the start of the playoffs. The 3 available positions can be filled by up to 3 players from the following list. All of these players are currently in the AHL: Sam Carrick, Brad Ross, Justin Dowling, Mathieu Tousignant, Patrick Cullity, Kael Mouillierat, Gord Baldwin, Andrew Carroll and Jeremie Blain. Any player additions need to be made by the start of the conference finals round of the playoffs. With the AHL season not set to end for another roughly 15 days, this is something that will be addressed here as the AHL season gets closer to its conclusion. Steelheads fans and hockey fans alike, it’s time for some playoff hockey so buckle up and let’s enjoy the ride.